The official beginning of the winter is just around the corner and after 8 sick weeks of #FALLRUNS the Snowpark Kaunertal will get some rest with it’s well deserved winter break after the FALL RUNS – FINAL Weekend (8.+9. Dec.)! To honor the end of this incredible time we want to celebrate the during the last weeks permanently upgraded and brandnew Snowpark a.k.a. #NATURERUN one more time in it’s full perfection! So we would like to invite all of you to let it crack all together á la Kaunertal Style this Weekend! To emphasize the chilled Kaunertal vibes and the cozy gathering of the pre – Christmas time you can look forward to our traditional “SNOWPARK TÖRGGELEN” on both Days, where you can heat up yourself with free maroni, “Glühwein” and “Punsch”! 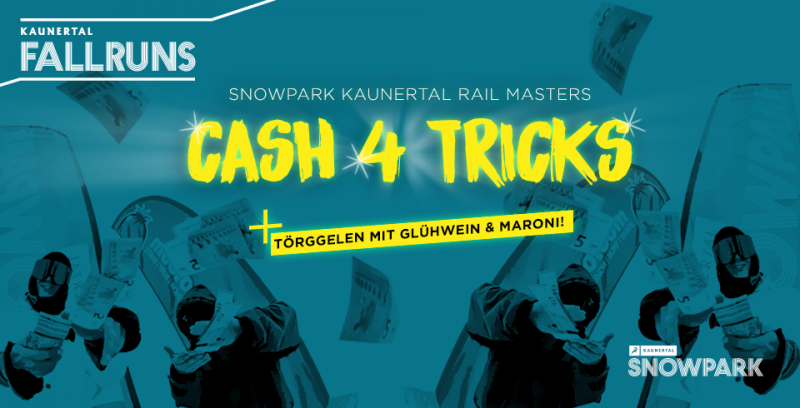 Kaunertal Jib Masters – CA$H 4 TRICKS SESSION! With maroni, „Glühwein“ and „Punsch“ right at the Parkbase – First come, first serve!